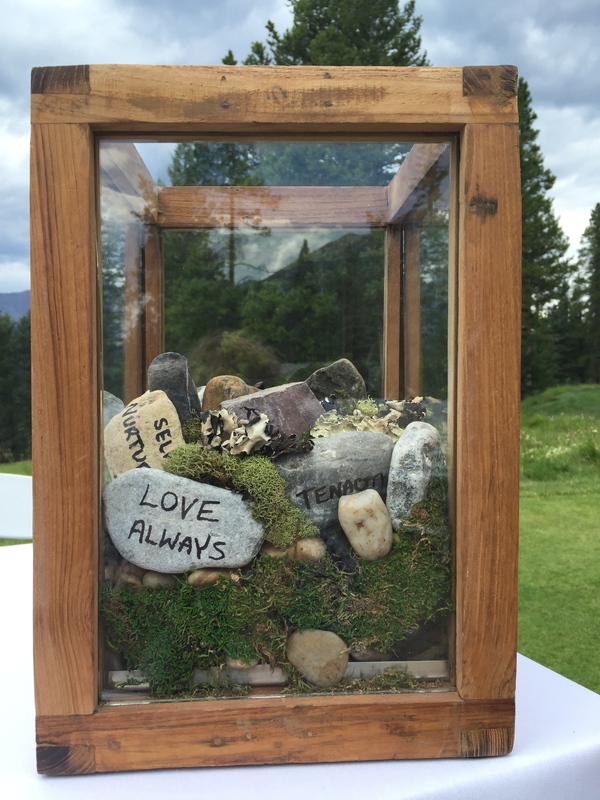 When I arrived at the venue the day of the wedding, I was delighted to see how they had transformed their ritual idea into a keepsake glass container, with the rocks nestled in bits of moss and twigs. During the ceremony, the last rock they placed in the container was for their family and friends. Their generous sincerity was touching and empowering, and it was one of the places tears sprang to the eyes. I had shivers more than once as we progressed through the ceremony, and I felt a bit like a proud mother when they kept us rapt during their complex vows. This is the joy that can come with creating and inventing meaningful ritual elements – and I am so grateful for the couples that take the leap and approach the opportunity to explore the possibilities for themselves. “Thank you. Words can not express how pleased we are with how the ceremony went. I have to email you, to tell you that countless numbers of our guests made similar comments throughout the day and continue to. Those are, “your ceremony was amazing”, “I have never cried so much in my life”, “you guys are an inspiration” and “this is the best wedding I have ever been to”. Barbara, without you, this would not have been possible. 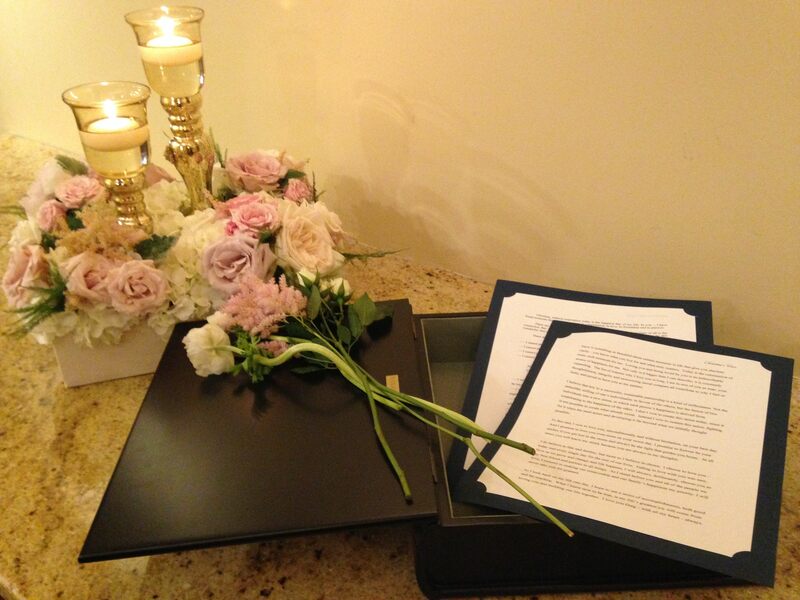 You were able to get us to think “outside the box” on our ceremony and create vows that were meaningful to us. People have commented on your sincere delivery of the ceremony and we are just so thrilled. Thank you also, for the package you put together for us of our ceremony, that is so special and will be a lovely reminder in the future. Fortunately, one of our friends casually filmed the ceremony for us, and we have already watched it back. Wow it was wonderful! Today, as the sunlight scrapes the horizon, bringing a short day of brilliant blue sky and sparkling snow, I realize another year has flown by and left me with the brightest memories. I’ve had lots of time in the last month to reflect on the past two years, which have been so wonderful in so many ways. It is a true honour and a privilege to do the work I do, and to have been able to be a part of so much joy and happiness does an old gal good. 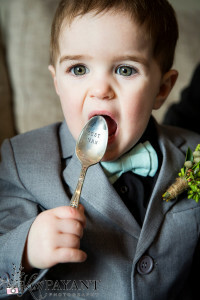 I think back to the weddings — and what fun they were. All those flowers, blossoming through every month of the year. Those gorgeous dresses, billowing, flowing, sparkling: from the simple to the elegant to the fabulous I’m-only-going-to-do-this-once dresses! The mountains, in all their moods; the meadows, in the wind and the rain and sunshine; the music; the groomsmen in their suits and grins; and my favourite of all — the looks exchanged between couples as they met face to face at the end of the aisle. The tears of family, remembering loved ones no longer with us; the adorable flower girls and the reluctant ring bearers who never failed to make us smile; the hiccups and the recoveries, the magical splashes of light and the secret words you whispered to each other up at the altar; and all those other words. The words I was so happy to write for each of you, and speak to you and your family and friends. And the words that you wrote to each other, and spoke, through tears and laughter, from your hearts! The rituals we enacted to remember; the traditions we created for you to step into over the years. Each one of the ceremonies I was part of was special to me in some way, and I remember what we created together with such pleasure. I think of you often – you’ll never know much I think of you, and silently wish you well. Wondering how you’re doing, how you are growing, what adventures you are up to now. A couple of you have new family members, babies born out of that love you share so deeply, and that thrills me no end. 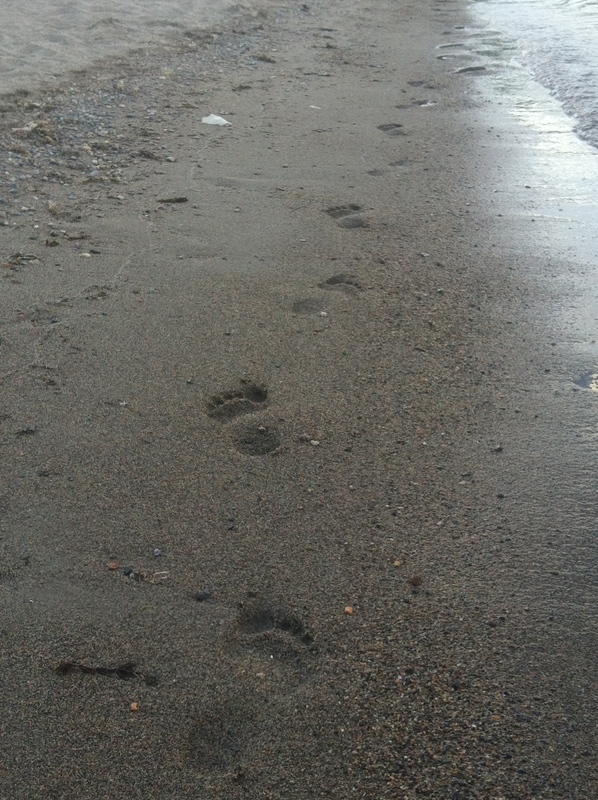 I hope you are growing together, and walking your road with intention and purpose. I hope you’re leaning on each other when you need to, and I hope you’re finding ways around difficulty, or through it. I hope through the tweaks and adjustments and surprises of partnership, you are using your friends and family to share your burdens and your pleasures. Remember they pledged their love to you, too. I trust gratitude has found its pride of place in your home. Every single ceremony I wrote in the past two years helped me think about love, and life, and I’ve had the opportunity to look at my own marriage through new eyes because of you. I know, without a doubt, I am a better partner for having read your intimate and honest reflections, and listened to you make your vows with such passion, determination, vulnerability and joy. You have inspired me, and have reminded me again and again, that love is the ultimate gift, the beginning and end of everything. So as this year comes to a close, I wanted to say thank you, and wish you the best of this season. Thank you for gifting me with a presence at your wedding ceremony, and for this ongoing commitment to wishing you well, through all the seasons of your lives. May happiness and pleasure be yours. May hope and prosperity be yours. May health and high trails be yours. All the best to you all as you move toward another year of loving. The ink is dry on the marriage licence, the dress is packed away, one or two of those fabulous photos have been framed, and is in a place of honour in your home. You are still basking in the glow of happy memories, the day those you love came together to help you celebrate what you two have with each other. 2015 was a wonderful year for me – I met so many interesting and passionate couples, and had such a good time getting to know all of you in different ways. I wish you all great happiness, that goes without saying. And I also wish you a good deal more of the imagination and dedication that you brought to your wedding; that creative, thoughtful dedication I witnessed time after time. Every one of you put your word on the line, and now you are figuring out what that means, and I feel a sense of kinship with you now. It is beautiful, on-going, demanding work. As I type this, my husband of 28 years is snoozing on the couch next to me. We have had a great deal of happiness, he and I. And the road was not always smooth or wide. I am ever grateful for the capacity we both developed to imagine a future together, no matter what roadblocks life wanted to put in our way. Thank you for sharing your biggest dreams with me. May you all continue in the direction of love’s ideals. If you advance confidently in the direction of your dreams and endeavor to live the life you have imagined you will meet with a success unexpected in common hours. You will pass an invisible boundary: new, universal and more liberal laws will begin to establish themselves around and within you and you will live with the license of a higher order of beings. If you have built castles in the air, your work need not be lost; that is where they should be. Now put the foundation under them. Snow is falling in fat flakes outside my window today, and all the couples that were married this summer are settling in to that period after the honeymoon. Living a life that isn’t so very different than it was last year. And yet. I found this poem by Mary Oliver a few days ago, while I was settling in to that post-summer slumber. still remembering and re-living all the precious moments of the past year, and taking a peek at what 2016 promises. My book is filled already with new names, couples who will dive into their reflection process, and bring themselves heart and soul to their wedding preparation. May this dark time seed the dreams that will bloom with an understanding of what our loves are not. Sometimes I get a difficult email or phone call. The bride, or groom lets me know the wedding is off, has been cancelled, and won’t be happening at all. I can tell what a difficult phone call or email that is to make. I don’t often hear the details of what happened, or why, but the pain is so evident. I had a phone call like that this morning, and I have been sitting with it for a few hours. When we hear of another person’s heartache, It’s so tempting to want to say something to alleviate their distress. The phrases jump to mind: don’t worry, it’ll all work out. It’s probably for the best. Things happen for a reason. Better to find out now. All those phrases we want to say to others when life gets difficult. That’s our nature, isn’t it? We are desperate to take away suffering. We want to make it better. I work hard at biting my tongue against those conditioned phrases, but finding the right words is not easy. This poem, by Jan Richardson has helped me this morning, to respond with love. To bear witness to another person’s pain, and not try to fix it, or minimize it, or to forget about it. 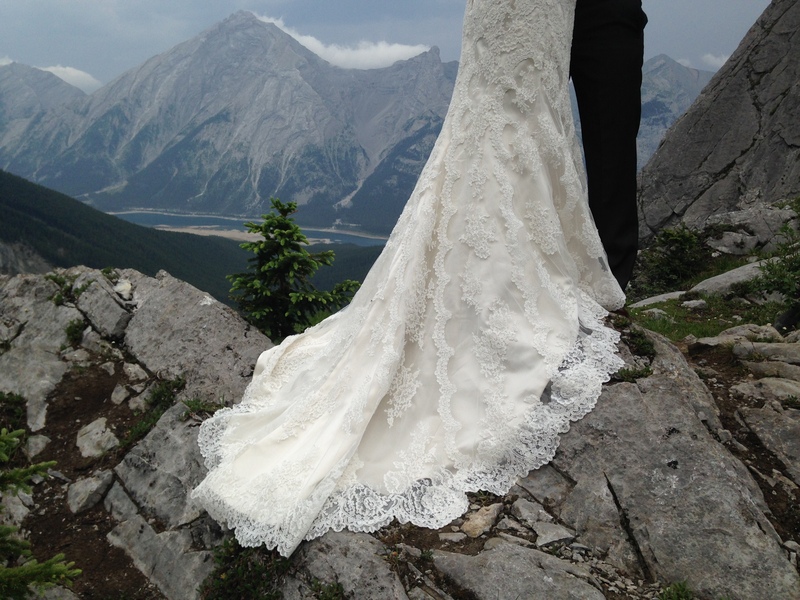 It has been a full couple of weeks, full meetings with couples who are planning for their summer 2016 weddings, and writing other ceremonies for this summer, emails back and forth with couples who are in their last few months of pre-wedding planning, fine tuning, and getting so excited, and then a few wedding ceremonies – the latest one on a hillside in Banff, with the most spectacular view, and a family that all participated with heartfelt comments and hugs and tears and laughter within the ceremony itself. So much joy, a ton of creativity, and a sense of blossoming hope. And then there were the conversations with couples who are now a year and two years married. Wonderful, rich conversations about how real marriage is, and how difficult. The absolute need for us to connect at a real level about what is hard, and how to move through the tough bits gracefully. After that, there was a blessed opportunity to participate in a family gathering at the committal ceremony for a dear friend, who was laid to rest in our local cemetery, next to her mom, dad and sister. It was a beautiful summery day, and we all took part in the most lovely ritual. A basket of dried flower petals, that had been collected in the house over the past year, was passed around our small circle. We each took a handful, and tossed them into the ground, overtop the hand-carved box that held her ashes. A gentle rain of flower petals covered the box until we could hardly see it at all. Beauty, as befitted her most beautiful spirit. It is a glorious day in the mountains. The sun is shining, the sky is blue, trees are blossoming, and the green leaves of the poplars have unfurled and presented themselves to the spring day. It does not feel like a day to die. Or to think about dying. Or to talk about death. And yet last evening, I attended a “virtual” Death Cafe, via telephone, with my Celebrant colleagues, and so death is on my mind. The phone call left me with such a tender feeling, an openness, and I suspect a clearer appreciation of this blessed day. 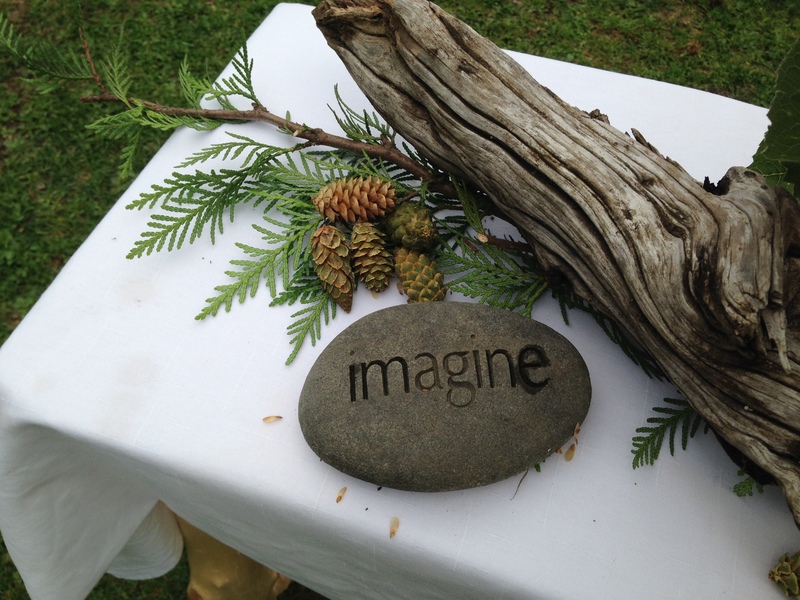 It was a wonderful opportunity to share time and space with others, to gently explore big ideas. Together we revealed, remembered and re-connected with the naturalness and the inevitability of death, and once again became aware of our one truly common link. Today I am thinking of those who may be in fact, actively dying this day. On this day, may you know the presence and support of another human being. On this day, may you remember that you are loved. On this day, may you find a place of peace. The marriage vows are truly the heart of any marriage ceremony. They are the high point, the climax of the dramatic arc that is the story of the ceremony. The couples I work with come to the vow section in many different ways. Some are very clear from the start – they want to write and speak their own personal vows. Others are hesitant, worried about their ability to speak such emotional material in front of friends and family. Through the process of working together, and through the process of writing their own reflections on what it means to be getting married, many couples decide that they can do it, and take on the writing and speaking of their own vows as we work together. Others are equally clear from the start – they want something traditional and simple, and they want to be able to say, “I do”, while holding hands with their partner. In a custom ceremony, anything is possible, and the process of creating the ceremony together is part of the wedding magic. Each couple has the opportunity to talk about what makes sense, what resonates, and what will make both of them comfortable. Which is why I often remind couples, the wedding vows do not have to match. Each of the partners can be free to approach the vows in a way that suits them, that makes them feel at ease. Comfort and meaning go hand in hand. Being comfortable at your own wedding ceremony should be high on your wish list, if you ask me! “This box contains the words you will speak to each other today. Your vows, which are your heart’s longing, and your mind’s attention. They are the promises that will not be fulfilled this day, but will unfold, day in and day out, as you live fully and deeply into them. Wedding season is fast approaching. I look forward to bearing witness to the many and varied promises that will be spoken this summer. On one of the last glorious fall weekends of 2014, I spent the day in my front yard, picking rocks. Since July 1st, our yard had been torn up, and it took us most of an busy summer to level it by hand and prepare it for remodeling. On that fall day, as I bent and straightened, plucked and dug, I found myself reviewing the passing of summer, and reflecting on the wedding season that was also coming to a close. Four ragged stones appeared on my shovel, and spoke to me of the extraordinary experience of being a full-time wedding celebrant in the Rockies. A few heart-shaped rocks sifted from the rocky soil to become the gifted memento of my incredible summer, in which I was witness to hearts of every shape and size. Every bride and each groom, each mom and dad and grandma and grandpa, all the best friends, the groomsmen and bridesmaids. Every one of those guests, dressed in good clothes, making the effort, having flown or driven, some miles and miles and miles, to be there. All hearts open, every single one of them, present and exposed, for the twenty or thirty minutes of ceremony, to the generousity of love. 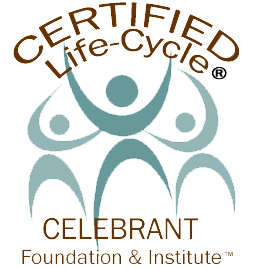 “My” couples had opened themselves to me, so freely and willingly, so I could get to know them and tell their story. I was so moved by that. And then, on their day, they showed up big time. They laughed, they cried, they shook with nervous excitement, they beamed with pride, they sweated, they glowed, they stood in the wind and the sun and their smiles were unstoppable. It was extraordinary. It was an terrifically good summer for weather, and most of the outdoor weddings went as planned under the dome of blue sky, open to the mountain backdrop. There were a few last minute changes, and some couples had to give up their dream of an outdoor wedding and graciously adjust to “Plan B”. They were rewarded with the warmth and solidarity of family and friends. We were serenaded by cello, violins, guitars, a bagpiper. One of the brothers became one of the sons, singing at two different weddings. One couple danced their first dance immediately after the ceremony in the mountain meadow. One wedding took place high on a mountain trail, so the tumbling brook seemed music enough for that processional. The bride’s dad, however, granted them an a capella solo; the mountains echoed with his song. Then there were the kids. Children tumbled in the grass, trampled through the wedding circle, wanted “up” during vows, stole the show with a curtsey and cried for uncle or mommy and held the ring box oh so carefully, or scattered the rose petals with such serious precision. They made their way down the aisle in the arms of parents and beloved grandparents. Some arrived in wagons, and others walked in two by two with a sign between them that announced, “Here comes the Bride”. Most sported big smiles, but one walked the whole length of the aisle with his eyes squinched shut. Some did not make it down the carpet at all. Preferring, in the glare of all those staring adults to stay in the back, thank you very much. The attendants were a bouquet of wildflowers – young and not so young, family and friends, matching and freeform. Parents came in all colours and spousal arrangements. All of them were pleased and proud and happy to be there to witness their sons and daughters, their best friends, their sisters and their brothers say yes to love. The ancestors arrived every time. Named or unnamed, we felt them hovering, the hundreds and thousands of couples who had already taken their turn at the wheel. When we called them by name, the ones recently passed, tears honoured their memory. Sorrow and gratitude and joy met the moment, and we were all touched by mention of those who could not join us physically. Each ceremony was different, and had its own special flavour. We made our ceremonies meaningful with words, with readings, and with ritual. Traditional, invented, and adapted, the rituals included beer, bread, wine, Sangria, river stones, knot tyings, hand-written letters, blessings, tokens, burning sage, the laying of flowers, building a cairn, a Harry Potter book, and of course, the rings. The bridal knots, tied with tartan, cord, satin ribbon adorned with charms, or climbing rope, became treasured keepsakes to take home. Every single ceremony ended with a kiss. (Several couples squeezed in a few unplanned kisses before, during and after the pronouncement, I noticed.) Somehow, through all those words, and actions and with all the focused energy of all those gathered, the unmarried became married, and began the joyful journey home. As I picked the rocks in my yard, I sorted through all the ceremonies, humbled by the abundance of happiness I was witness to. I probably said the word Love about a million times, and I meant it. And they heard it, I could see them listening. Those couples put their hearts on the line, in public, and made their vows to each other in front of those they cared most about. It was extraordinary. I was left that autumn day with four stones, a plentitude of memories and a deep satisfaction that comes with a good day of working in the dirt. I don’t know what will happen to all those couples. I know they’ll have wonderful lives. And I know their lives will be painful, and suddenly shifted, and surprisingly difficult. I know they’ll forget the exact wording of the vows they so carefully promised. But I know they won’t forget their day. In the remembering, they will perhaps be reminded, as I was, of the heart of the whole matter. Which is everything about hope, and a few things about faith, and everything about yes. And something about our hearts, which, no matter the size, are somehow big enough to contain a world of love.